the actual amount, I'll give you $10. In pennies. Just kidding. If you guess closest, I will give you a $10 bill, or I will send you $10 via PayPal. I started saving loose change in a plastic pretzel barrel when I went to college in the fall of 1999. Now it is full. 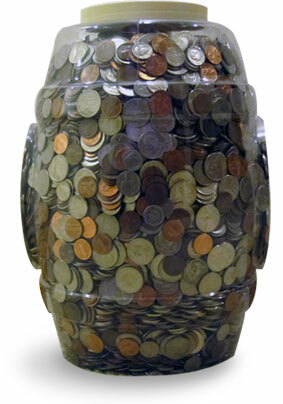 The barrel contains United States pennies, nickels, dimes, and quarters. There are no half-dollars or dollar coins, nor are there any foreign coins. ...the coins are not evenly distributed; that is, there are not equal numbers of pennies as there are dimes. Statistically-speaking, you are more likely to get quarters and pennies back in change when making a purchase. The barrel is 13 inches tall, 7 inches in diameter at its top and bottom, and 8½ inches in diameter in the middle. I will not weigh the barrel, so don't ask how much it weighs. I will say, however, that it is very heavy, so rather than lift it I slide it around on its base. I have to push off with my feet, too. I don't roll it because I don't trust the plastic to not break. Sorry, kids, but this contest is over! OH, BOY! OH, BOY! OH, BOY! RESULTS! *Well, some of it anyway. The contest will run through the end of May 2011. Only one entry allowed per person, which is enforced by allowing only one entry per email address. So don't mess up your guess. That means if I don't know you personally you can use multiple email addresses for multiple guesses, which is sort of like cheating. Please don't be that guy.